How does design affect motion? This was the driving question for a third grade, cross-curricular STEAM project. 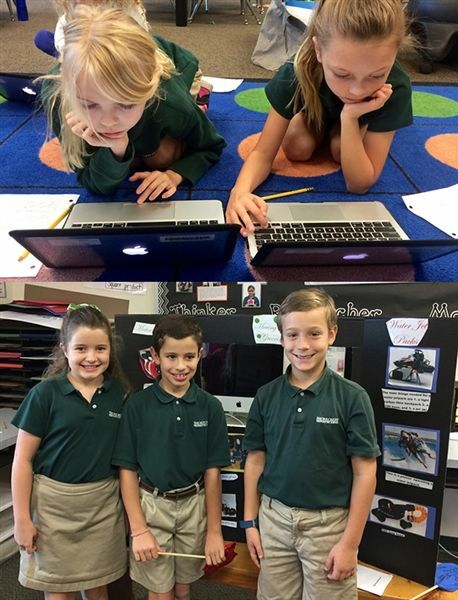 Third graders began their motion and design study by learning about simple machines. They researched what the six basic simple machines are, and walked around campus to see if they could find examples of them. They were surprised to see that everyday items such as a doorknob or a playground slide have the advantages of a simple machine! On a special trip through the maintenance shed, Mr. Sharlow shared all types of simple machines that he uses on a daily basis to keep our campus in working order. The children also had the opportunity to explore simple machines on a trip to The Wonder Studio, led by Shannon Lipan. Although we may take many modern conveniences for granted, engineers of all types continually work together to design better and more creative devices that help people do more with less, incorporating the principles of simple machines. To introduce how design affects these concepts, guest expert and Charger parent Dan Spada came to teach about the evolution of skis. He shared with the students how skis have changed over the years and how current skis are made. He talked about the design of wakeboards, skateboards and snowboards as well. For some hands-on learning and critical thinking, students became engineers for a design challenge. They used K'NEX to see if they could build a vehicle that could travel 100cm. Initially they tried to build through brainstorming design ideas, but eventually the children learned about creating a prototype that starts with scientific drawings and blueprints. They worked collaboratively to try to follow a drawing in order to make a K'NEX vehicle that could successfully complete the challenge. Next, they added coding to their engineering. The children built simple machines with LEGOs and tried programming their builds in the Learning Lab. Mrs. Craft, Lower School Dean of Curriculum and Instruction, spoke to the children about the four forces of flight (lift, thrust, drag and gravity) which determine how a plane flies. To make these abstract ideas more relatable, third graders made paper airplanes and tested them to see which type of plane flew the farthest. Finally, students had to bring together all they had learned, and were assigned a project they could present about how design affects motion. They decided on a topic they were interested in learning more about, completed some initial research and created a mind mapping web on Google Drawing to jot down notes about what they learned. They were then grouped with other classmates who had a related topic and had to create a presentation to demonstrate what they had learned. Parents and friends were invited to observe the third grade motion and design presentations. From slideshows to dioramas to puppet shows, the projects displayed depth and expertise in their newfound knowledge.